Now just all the sewing to do. 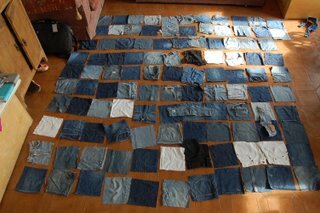 Jamie has been collecting old jeans for the last 5 years to make a patchwork with. I have to say for the past 2 years he has not been the easiest person to live with, teenage angst hit hard. Needless to say every time I suggested we work on his project it was met with a firm NO. We had such a laugh remembering who had worn which jeans and I laughed at him because he insisted on keeping the pieces with “nice” holes, I am sorry honey but a holey pair of jeans is just that! Jamie started a new school in September after fighting the system (and us) for almost 2 years. We got to the end of half-term with only one minor bunking off on the last day, this is a major achievement and I am very proud of him. He is studying Mens Tailoring at school and apparently its fun, yeah! At home in the last 8 weeks he is a different child, he gets up for school with no arguing, he chats about his day, he asks me sewing terms in english, he talks about project work, he reads my Vogue magazine, he is not fighting with his brother so I am kinda hoping the teenage thing is over. Maybe I will be better at the parenting thing with the other two! Or with any luck they won’t feel the need to rebel quite so much! Yay !!! Im not the only mother of an ainsty teenager !! mine are 14 & 13, we are just entering that which is known as parenting hell.. I agree… poor rammy ehhh, daft beggar knows the girls are comming into season & has already tried to climb outa the field 3 times this week. Its all fun ! 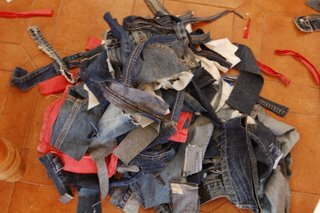 What a great idea for recycling old jeans! I’m knitting a lace scarf for my mom for Christmas and I’ve had to start again (luckily I hadn’t gone too far.) I learned not to knit on Hallowe’en night when the doorbell keeps ringing, and I’m picking up and putting down the knitting all evening. They do come out the other side, as you have seen. A couple of years ago my boy seemed like a stranger, now he is recognisable again – I love him so much, as I never stopped doing, that it hurts. Sadly he is having a tough time just now and I just wish he was a little boy that could snuggle under the duvet with me again…. HURRAH! I think this is a wonderful project to work on with your son. And even more cool: He’s studying men’s tailoring! What a great project to have to do together. I am beginning to see a glimmer of the teenage years in Sam and I’m not looking forward to it! 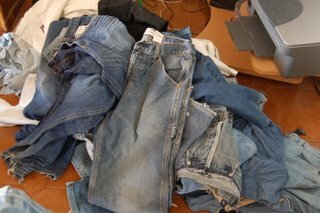 I dragged jeans all over the country for a while, dreaming about making a quilt from them, and then finally gave up. The idea has never lots its appeal though. ; ) Can’t wait to see.